Tellapur area is located at the serene place in the Medak District of Telangana. The area is emerging as one of the residential localities in Hyderabad due to its proximity to the IT hubs and business districts. Many developing infrastructure facilities include Multi-Modal Transport System (MMTS), wide roads, foot over, etc. are expected to give a boost to the real estate sector in this area. Why buying a villa in Tellapur is the best decision? Many reputed builders are constructing luxurious villas with state-of-the-art amenities, and ample space at affordable rates. Buying luxury villas in Tellapur are the best investment you can make. Tellapur is just 10 km away from the Financial District of Gachibowli and also near to Infosys, Wipro, Microsoft and Polaris offices. BHEL Township is 2 km from the Tellapur area. The area is 1.5 km to the Mumbai Highway (NH-48). The area is also close to the Outer Ring Road (ORR), which allows residents to enjoy clean roads and have easy access to all parts of the city. The Rajiv Gandhi International Airport at Shamshabad is 40 minutes traffic-free drive via ORR from Tellapur area. The area also has well-equipped social and civic infrastructure like prominent international Schools, hospitals, eateries and banking facilities. The area offers affordable luxury villas when compared to other neighbouring areas. The upcoming villas in Tellapur offer unique facilities like cross-ventilation, 24/7 water-supply, 24/7 electricity and much more. They also have excellent amenities like swimming pool, landscaped gardens, gym, and so on to enjoy a comfortable lifestyle. The area offers a pollution-free environment with less congested roads. Tellapur is decent and calm locality with natural surroundings. It is a very peaceful area surrounded by a lot of greenery. Nallagandla Lake (Natural water bodies) is in Tellapur. The availability of new projects in the locality and proximity to Gachibowli adds to the growth of rental demand here. Thus, investing in villa projects at strategic locations will give you an excellent return on investment. Do you plan to buy a villa in Tellapur, Hyderabad? Everyone dreams of buying a home to lead a relaxed and comfortable life. The upcoming villas in Tellapur offer unique facilities like cross-ventilation, 24/7 water-supply, 24/7 electricity and much more. They also have excellent amenities like swimming pool, landscaped gardens, gym, and so on to enjoy a comfortable lifestyle. All the gated community villas in Tellapur provide round-the-clock security. They monitor entry/exit, common areas, and provide a safe and secure environment inside the gated community. If you buy a villa in a gated community, the common amenities and activities on the premises encourage social interaction and community living. The residents are a mix of like-minded people and people from similar walks of life, making it easier to socialise and enjoy a pleasant and cordial relationship with your neighbours. The beautiful landscaped gardens, spacious play areas and other recreational spaces make you more joyful. Nowadays many people love to buy eco-friendly homes as they care for the environment. Buying a villa with rainwater harvesting pits, solar energy, etc. will save energy. Muppa Developers are one of the reputed builders constructing luxurious villas with high quality and comfortable facilities to suit your lifestyle. 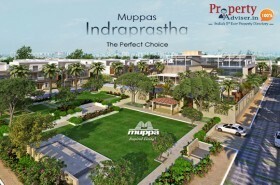 Buying Muppas Indraprastha, a luxury villa in Tellapur will be a wise choice to lead a comfortable, healthy and decent lifestyle. Visit Property Adviser to know more about premium villas for sale in Tellapur, Hyderabad. Why Tellapur is the Best Destination to buy a property in Hyderabad?